University of Washington Press, 9780295996684, 304pp. 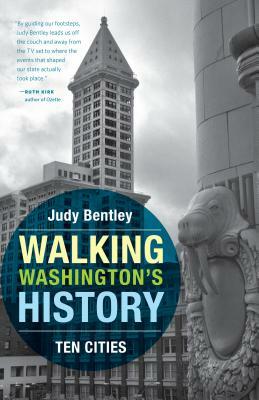 Walking Washington's History: Ten Cities, a follow-up to Judy Bentley's bestselling Hiking Washington's History, showcases the state's engaging urban history through guided walks in ten major cities. Using narrated walks, maps, and historic photographs, Bentley reveals each city's aspirations. She begins in Vancouver, established as a fur trade emporium on a plain above the Columbia River, and ends with Bellevue, a bedroom community turned edge city. In between, readers crisscross the state, with walks through urban Olympia, Walla Walla, Tacoma, Seattle, Everett, Bellingham, Yakima, and Spokane. Whether readers pass through these cities as tourists or set out to explore their home terrain, they will discover both the visible and invisible markers of Washington history underfoot. Judy Bentley writes hiking guides, history, and biography and is emeritus faculty at South Seattle College. She is the author of Hiking Washington's History and (with Lorraine McConaghy) Free Boy: A True Story of Slave and Master.